Mercedes-AMG SLC 43 – is it a true AMG? These days the AMG badge is getting slapped to virtually anything. Mercedes’ tuning division has been tinkering with practically every Merc on sale, even the diesel variants. From estate cars and limos to small A-Class shaped hatchbacks. They’ve worked their magic on a lot of vehicles, but weirdly, a good bunch of them received criticism for not being proper AMG cars. Trouble is, the old-school AMG we know is long gone. In fact, AMG hasn’t been what it used to be for quite some time. That’s not necessarily a bad thing, it’s just different. 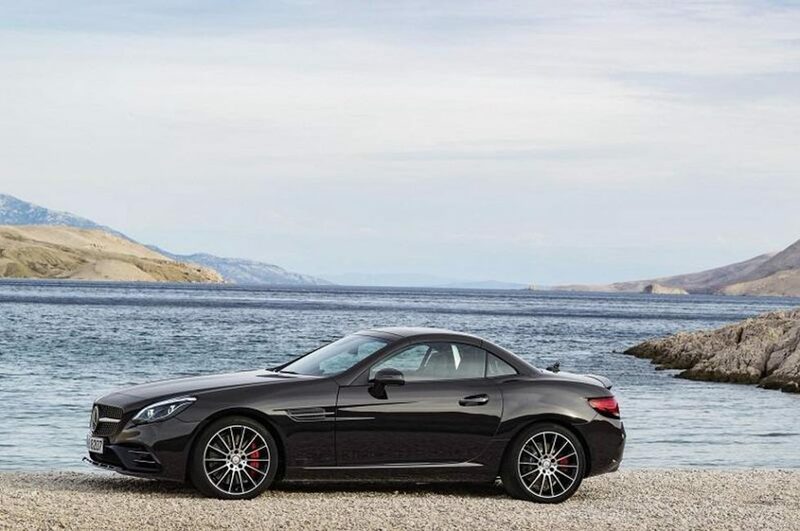 Proving our point, right on cue, is the Mercedes-AMG SLC 43. The current SLC is a weird thing. It shares a lot of its components with the old SLK (chassis, interior and electronics), but it somehow manages to feel new. Then you have the AMG model we’re discussing today. It’s a step-up above the standard SLC, making things even more confusing. As of now, the SLC 43 is the most powerful SLC available, presumably until the SLC 55 comes along to take its crown. Let’s start with the positives. The 3.0-liter twin-turbocharged V6 engine is a real powerhouse. It produces 362 bhp and a meaty 384 lb-ft of torque. Power is naturally sent to the rear wheels, this time via the new 9-speed auto box. There’s tons of power everywhere throughout the rev range. Floor the loud pedal and it squats, catapulting towards the horizon. It’s not frantic though. Power delivery is linear and quite relentless. The Mercedes-AMG SLC 43 certainly packs a decent punch for a 3-liter V6. In Sport+ it even crackles and bangs on overrun, but you have to be outside the car to really enjoy it. The pops and bangs are good, but the engine note itself isn’t. At anything under 3,000 rpms it sounds cold and distant. Perhaps we’re not used to anything less than spectacular engine noise from an AMG. Rev it out past 3,000 rpm however and it wakes up. It doesn’t help fuel economy but it certainly makes the car a lot more fun. The SLC 43 is let down in several crucial areas. For starters, the interior doesn’t feel anywhere near as special or as great as its price tag suggest. This is a £47,600 car before options, but you wouldn’t be able to tell that just on interior alone. It’s not bad, but it isn’t as good as, say, a C-Class coupe. The roof mechanism makes quite the racket when it’s in motion, but at least it’s all over with quickly. Is it a proper AMG then? Well, if an AMG to you means a large, shouty V8 and generating tyre smoke everywhere, then no. It is however, quite good. Dynamically, the Mercedes-AMG SLC 43 is agile and light, despite the lack of steering feedback. The engine is strong and we like the fact that it’s a proper little convertible. As far as we’re concerned, the SLC 43 is alright. If Mercedes can improve the interior just a tad, it’ll be neigh-on unbeatable for what it is.